Right on schedule, Research In Motion’s (RIM) new on-device, BlackBerry mobile application store, BlackBerry App World, opened its virtual doors for business yesterday, in time for the Spring 2009 CTIA Wireless event in Las Vegas. 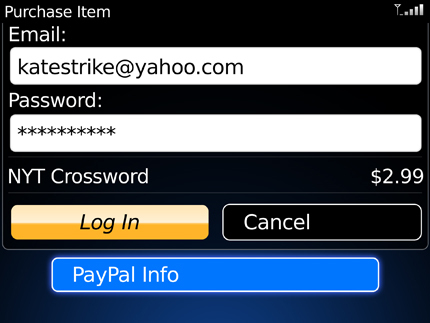 RIM was nice enough to share key details and screenshots of the new storefront ahead of time. 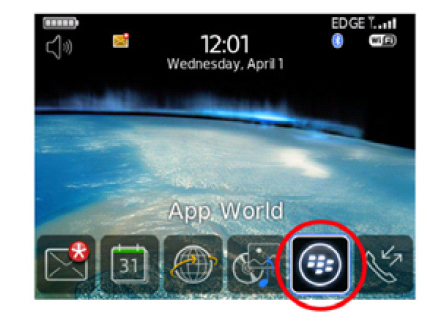 You can download the BlackBerry App World client using the BlackBerry browser from Mobile.BlackBerry.com and BlackBerry.com/AppWorld. I haven’t had the time to put App World through the motions quite yet, but you can expect a full review in the very near future. Until then, here’s what we now know about BlackBerry App World, as well as a dozen images of what the new software store looks like and how it works. The Search bar on specific Categories pages helps find exactly what you seek. After finding an application of interest, you can click its name to display additional details, such as the app maker, price, ratings and screen shots. Once you locate an app, you can purchase it via PayPal with just a few clicks: one click for the Download button, another for the PayPal login screen–you must also enter your account information–and you’re good to go. You can write application reviews directly from the My World screen on your device. If you purchase a new handset, any and all apps you bought from App World can be transferred to the new device free of charge to as many as three devices per year. Any and all apps you purchase can be deleted from your device and reinstalled as many times as you please, so App World also works as a virtual storage unit for software you download of purchase through the store. 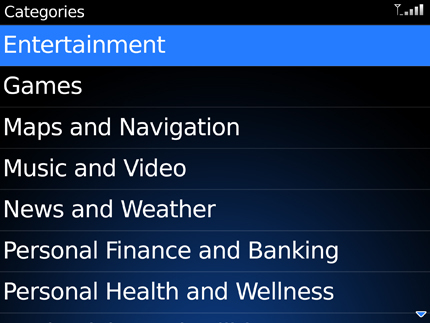 RIM is also expected to unveil a new BlackBerry-specific mobile TV service. Such a service would be both new and exciting. It would also make perfect sense, as simple TV/movie content delivery is a clear advantage Apple and its iTunes Store currently have over RIM and other handset makers. If the report pans out, RIM just may give the iTunes Store a run for its dollars. As described, it would provide a couple of advantages over the current iTunes content delivery system: 1) Such a service would allow you to bypass your PC and download video content directly to a BlackBerry over Wi-Fi, and 2) a monthly subscription model would enable you to view more content for less, i.e., get more bang for your buck, since monthly content availability would be unlimited—though pricing information is unavailable. iPhone owners must plug their devices into a PC to transfer video content. And most standard definition TV shows on iTunes costs $1.99 an episode, which can add up rapidly. A few technical unknowns still remain, however. One question that jumps immediately to mind is how BlackBerry Storm owners, who lack Wi-Fi in their devices, will take advantage of the service. Considering the BlackBerry Storm has the largest display of any BlackBerry, which makes it best suited for video viewing, it seems unlikely that RIM would leave the Storm off the list of support devices on launch day. One simple solution is that RIM will also offer a desktop-based App World purchasing option, so users without Wi-Fi can still join in the fun. This might not be ideal for Storm owners, as it could severely hinder the service’s value to business travelers and other folks on the go. But it’s better than nothing, I guess.